State Library Victoria – International Zine Library Day! Barely two weeks ago, I had the privilege to attend the third Zine Librarians (un)Conference in the USA, this year held at the University of Wisconsin-Milwaukee. This event was a long time coming for me, having sadly missed out on attending the first one in Seattle in 2009 (though I managed to sneak into Zine Librarian Zine #3, which was launched there). That was made up for in spades this year by also participating in a zine-making librarian zine-reading tour entitled Orderly Disorder, which started at the tail-end of the American Librarian Associations 2011 Annual Conference in New Orleans, Louisiana. What’s more, we were actually TRAVELLING in a zine library. Quite an adventure, indeed. When we were deciding which day to hold it on, we knew that it would at the very least need to be in July, as that is International Zine Month. A little more discussion, and it was pointed out that the 21st would make sense, typographically (ie: 21ne… get it?) So, July 21 it is. So, people, if you’re lucky to live near a library, community space, or infoshop that has a zine collection, be sure to drop by this Thursday 21st July, and take advantage of these unique collections – ephemeral, literary, artistic, rebellious, subversive, and most definitely important. Then go and make a zine of your own. Heck, make a dozen. YES! thanks for wording me up about this one John! 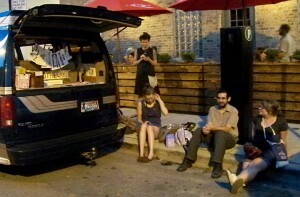 Is that zine-making hero Dave Roche I see casually relaxing next to the zine library in the photograph?